We were asked to work with council officers to enable communities to play a major role in assessing and agreeing sites for housing development and see the results of their work embedded in strategic plans. Officers were keen to evolve the process of plan preparation in line with the localism movement and increasingly proactive communities. The approach was collaborative right from beginning and involved working as part of the local authority team, and together with local communities, through Parish/Town Councils, to produce professionally rigorous, thorough yet easy-to-use site assessments. In B&NES a fantastic 90% of local councils assessed their possible sites welcoming the opportunity to "contribute local knowledge and experience before any planning applications were in place”. From relatively small input of our time and officer time, an astonishing 384 days of volunteer time input, resulted in detailed site assessments throughout most of the rural and town areas. 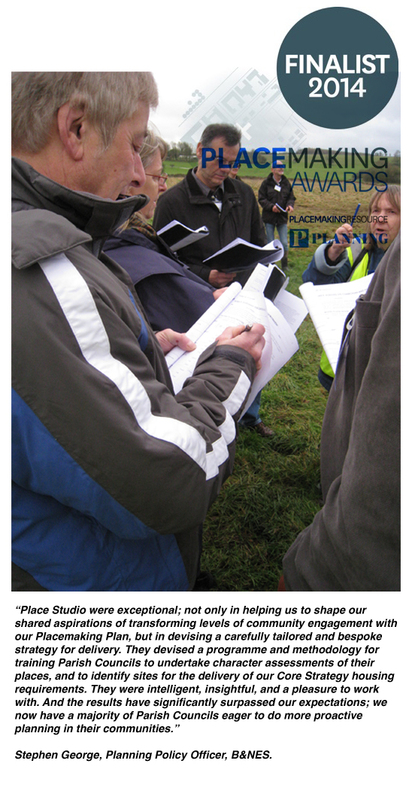 The site assessment material together with other technical information, forms part of the material that Council Officers are using to assess each specific site submission. Officers are visiting all sites suggested by communities as part of the next step in the process of allocating sites for development taking into consideration both community assessment material and other technical information in the decision making process. Find out more about the B&NES Council Placemaking Plan which is at final draft stage (Oct 15).